June 4, Thursday - Keepers moonlight paddle, Linden Mill Pond Dinner at Bridge 117 @ 6:30 pm Paddles wet 7:30. June 6, Saturday - Keepers Linden’s river cleanup meet 8:00 am Linden Mill Pond. We’ll have two groups, one going up river to Tupper Lake other down river to Hogan Rd. This includes litter cleanup along the banks and Mill Pond. June 7, Sunday - Headwaters Trails River Cleanup We’ll go from Holly Water Works Park to Strom Park in Fenton to prepare for the Adventure Paddle the following Sunday. Meet at 9:00 in Water Works Park. 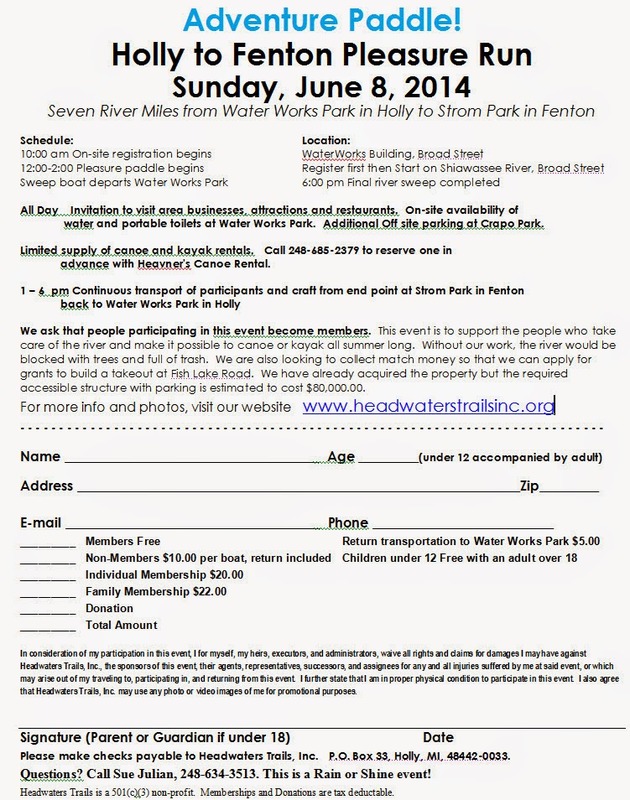 June 14, Sunday - Headwaters Trails "Adventure Paddle" registration begins at 11 am. Pleasure Paddle starting on river at noon, sweep boat launches at 1:00 pm. 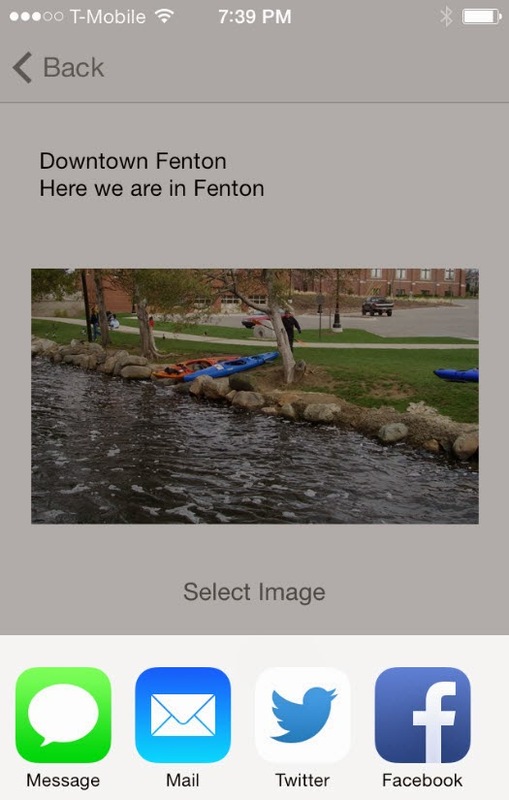 June 18, Thursday - Fenton Music in the Park & Farmers Market Keepers will launch from Strom Park in Fenton and then paddle into the mill pond by the gazebo to listen to the free Concert from 7 - 8:30 pm. Paddles wet at 6:30 pm. June 22, Monday -Shiawassee River Paddle from downtown Linden to McCaslin Lake Road. Meet at 11:00 am in the parking lot beside the river and behind the businesses on Bridge St. We will shuttle cars and be on the river by noon. June 27, Saturday - City of Fenton river cleanup meet 8 am in Bush Park behind St. John’s church off Adelaide. 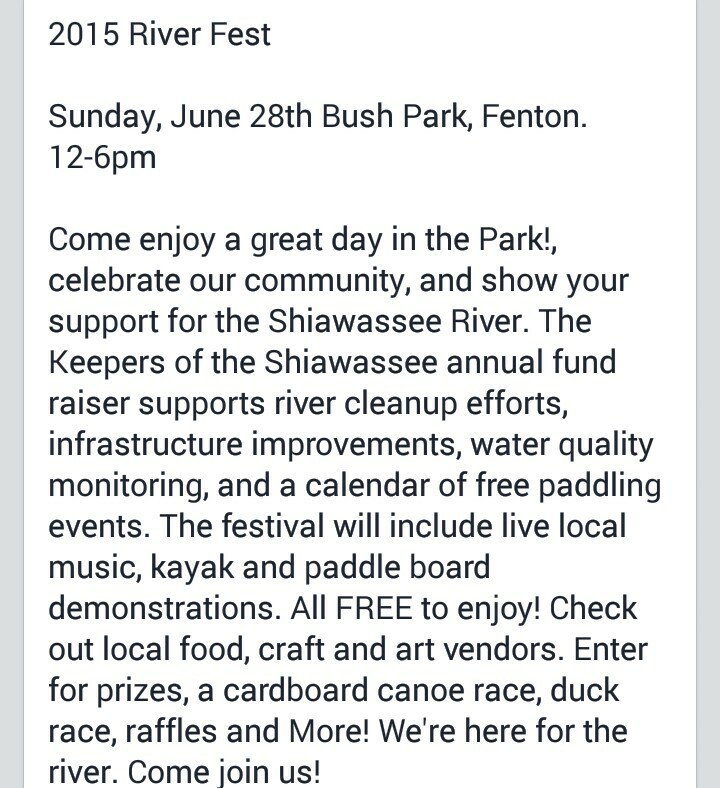 June 28, Sunday - River Fest in Fenton Bush Park from 12 - 6 pm, music, food, ducky races, cardboard boat race and more! July 12, Sunday -There will be a river cleanup on this day but depending upon the success of the previous cleanups, it has not yet been decided which stretch of the river will be worked on. July 20, Monday – Shiawassee River Paddle from Byron to Geeck Rd County Park, Durand. We’ll stop mid-point at Walnut Hills for snacks & break. Meet at the Byron HS ball field at 11:00 to shuttle cars’ paddles wet at noon. Boat rentals are available from Cheff's Canoe rental 989-288-7067. July 29, Wednesday – Linden Music by the Mill (actually on the water) Backbeats - Beatles Tribute Band 7:00 to 8:30 Listen on the water! You can paddle from Fenton’s Bush Park, Lake Ponemah’s boat launch or launch directly on Linden’s Mill Pond. 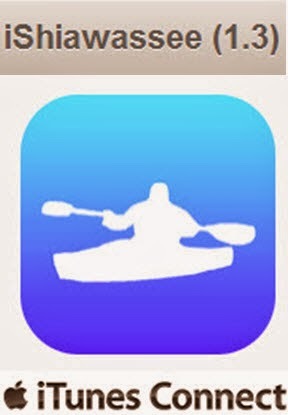 July 30, Thursday- Keepers moonlight paddle, Linden Mill Pond. Dine together first at 6:30, paddles wet at 7:30. Restaurant TBA. August 5, Wednesday - Linden Music by the Mill and Farmers Market Free concert by the Mill 7:00 – 8:30 Enjoy the farmers market, grab something to eat and launch at your convince. August 19, Wednesday - Linden Music by the Mill and Farmers Market Free concert by the Mill 7:00 – 8:30 Enjoy the farmers market, grab something to eat and launch at your convince..
August 17, Monday - Shiawassee River Paddle from Shiatown Park in Vernon to Lytle Rd Park in Corunna. We can continue to McCurdy Park in Corunna or portage the dam to Harmon Partridge Park in Owosso. August 27, Thursday - Keepers moonlight paddle, Argentine. Meet at Lobdell Lake Boat Launch off Argentine Rd. Paddle to Planks on the Lake Restaurant then back to the launch in the moonlight. Paddles wet at 6:30. September 24, Thursday- Keepers moonlight paddle. Holly. Meet at Holly’s mill pond across from Waterworks Park on Broad St. We’ll paddle up river then have dinner in Holly after the paddle. Paddles wet at 6:30 pm. October 3, Saturday - Headwaters Trails "Canoeing in Color” Paddle from Holly Water Works Park to Fenton Strom Park. Registration opens 11:00 in Water Works Park with boats launching at noon. Boats rental through Heavners Canoe Rental 248-685-2379. Call in advance to reserve a canoe or kayak. 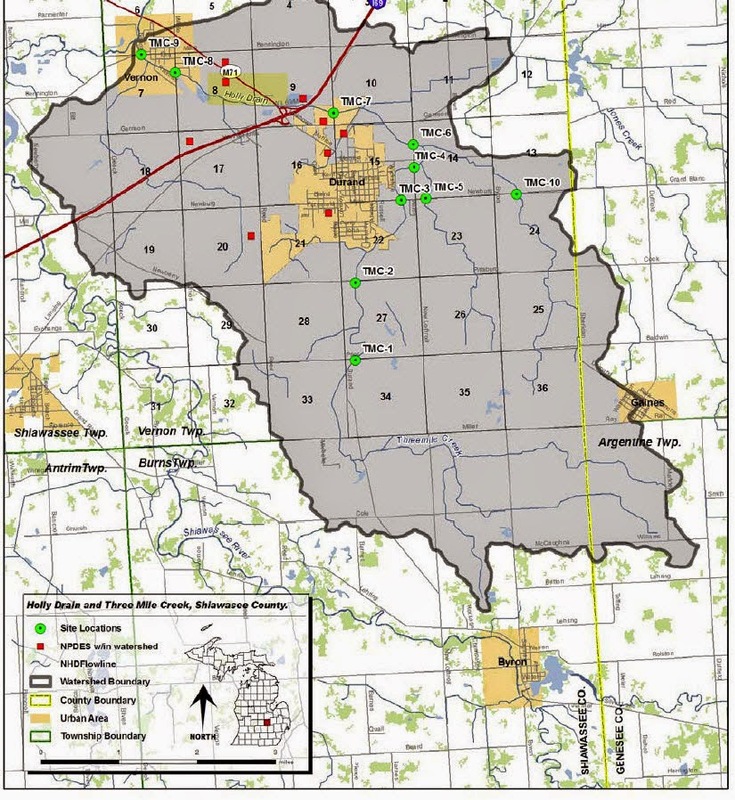 Holly Township, working with Headwaters Trails Inc., submitted a grant application for $45,000 to the Michigan Natural Resources Trust Fund for a Fish Lake Road Launch and Parking construction project. HeadWatersTrails Inc out of Holly,MI needs to get the MDEQ and Road Commission permits approved and raise the final $15,000 match money needed for the project. Any donations you can give toward making that match will be greatly appreciated, - not only by Headwaters Trails and the people who currently use the river, - but by future generations who will use this site and enjoy the beauty and serenity of the Shiawassee River. As many of you know, Headwaters Trails has been working on keeping the Shiawassee River open for paddling by doing things like building a launch at Water Works Park and a bridge there to get to the launch from the parking area. That is the start of the Shiawassee River Heritage Water Trail in Holly. 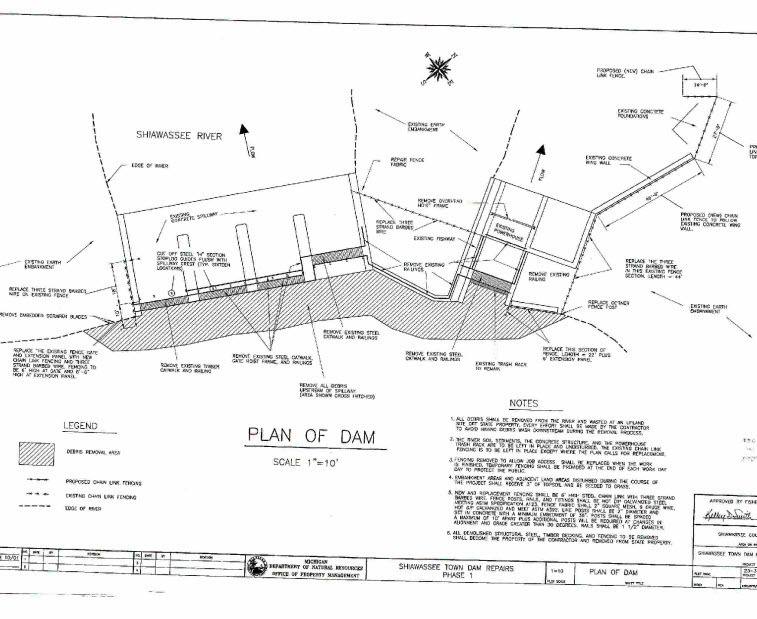 At Fish Lake Road, down stream from Water Works Park, Headwaters Trails has purchased land to build a canoe launch which can function as a take out for people who only want a short trip on the river. grant application is to fund this project. Headwaters Trails Inc. is a 501c3 Federal non-profit corporation. Money donated is tax deductible. Many folks are hard at work updating new river maps for recreation near and upon The Shiawassee River. Look for them at upcoming events like Fenton Expo, Quiet Water Symposium in Lansing, and other venues. With a little prior planning, a canoe/kayak trip of 20 miles in one day is quite possible. Explore new areas, see more wildlife, and experience a different section of the river. Some parts are skinny, some wide, others flow slow, while certain sections are quick. Something for everyone. Get some some friends together, stage some vehicles downriver , then everyone shuttles back to the launch site. Take lots of pics throughout the day, share with people , let them know about your adventure on the Shiawassee. Marjorie Frisch confirmed that Beacon and Bridge gas station is responsible. and owned by Quick SaV Food Stores LTD, out of Flint. Bureau of Fire Services (LARA) was notified upon confirmation. to deal with all contamination issues. The DEQ will work with the gas station during these 180 days. put in a vapor mitigation system at the affected business. were tracked back to the gas station’s underground storage tanks. The DEQ remedied this situation with the implementation of the mitigation system. have been a very stressful time as a property owner due to the situation at hand. “I am relieved that this issue is finally coming to light. the situation and what they uncovered was very shocking." prompting Linden City to change its mind on purchasing the parcel. and to find out what will be done next. helped determine why the contamination ended up at Begola’s business. they had them come back for more testing. we need to have this problem taken care of,” Zelenak said. “We’re just pleased that we are moving forward with this with the help of the DEQ. Residents may call Frisch at (517) 284­ -5101 with questions or concerns. and at city hall and the library. Shiawassee River just upstream of the Bennington Road bridge. members of the Friends of the Shiawassee River (FOSR). of the dam to maintain the river’s shape and integrity. those in the river’s contiguous vicinity. of flood insurance and the issue of the dreaded sea lampreys. Burk replied that he was not sure. 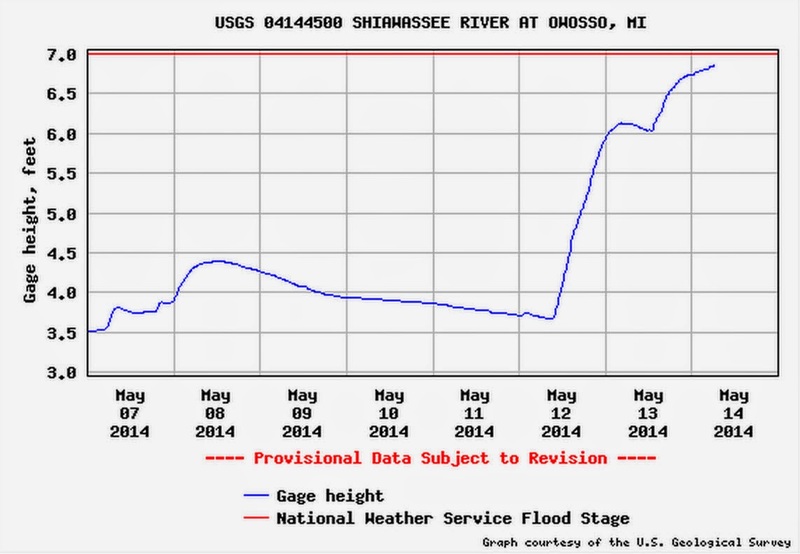 Where IS the Shiawassee you ask ? Aug. 13 for a new footbridge that has been constructed over the Shiawassee River. chamber of commerce, according to Chris Mishler, a volunteer who helped with the project. the bridge and refreshments will be served in Cole Park. that includes the Conservation Easement Incentive Act. federal tax deduction for conservation easement donations. historic resources in northern Oakland county. shown by the votes of Representatives Rogers, Bentivolio and Peters. for future generations to farm, graze or simply enjoy. this vital incentive for conservation permanent. Now it is up to the Senate to vote for it. over the finish line and make the incentive permanent once and for all. have this important incentive in our conservation toolkit. of the Michigan Municipal League. 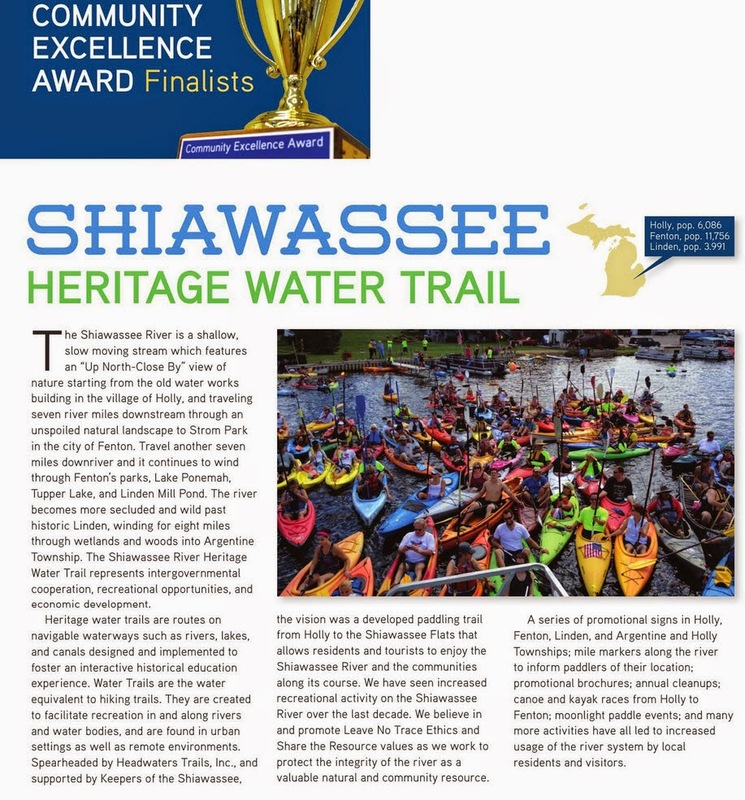 and as the centerpiece to many Shiawassee County communities. and two service groups selected sites to clean. at 9 a.m. on July 26th. Friends of the Shiawassee River extends our deepest appreciation to our volunteers. There were some glitches, hiccups, overflows, etc. Sunshine helps kill most forms of ecoli as the river levels drop. Attempt to paddle upon the water, stay in your boat as much as possible. 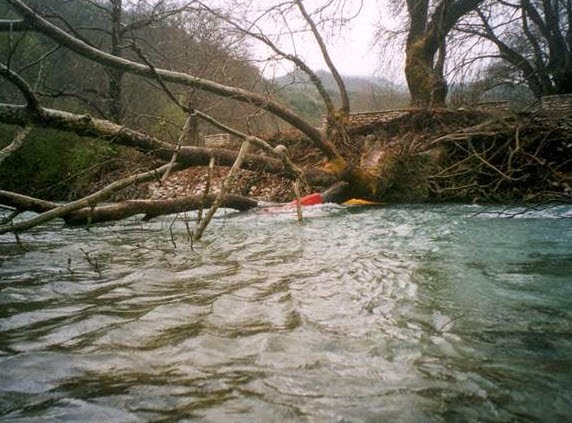 If you do go in the river waters, take a shower or bath soon afterwards. Remember, it's all highly highly diluted with millions of gallons of rainwater. Infrastructure, underground piping, treatment plant capacity, etc. in a manner that can handle multiple severe rainstorms in the springtime. It can't be forgotten, pushed off till next year, again and again. this week experienced a sanitary sewer overflow. into the Holly Drain north of the plant near Durand Road. Approximately 143,000 gallons of partially treated wastewater was discharged. The Holly Drain flows into the Shiawassee River near Vernon. http://bit.ly/DurandH2O into the Holly Drain north of the plant near Durand Road. Shiawassee County Health Department at 743-2390. May 16, 17, 18 in 2014 due to recent rainfall. - or the power behind moving water in a river. - that is 800 lbs of force hitting your boat/body. - a few feet is plenty to be a problem in a pinned kayak/canoe. on Dort Highway/I-69 interchange in Flint. 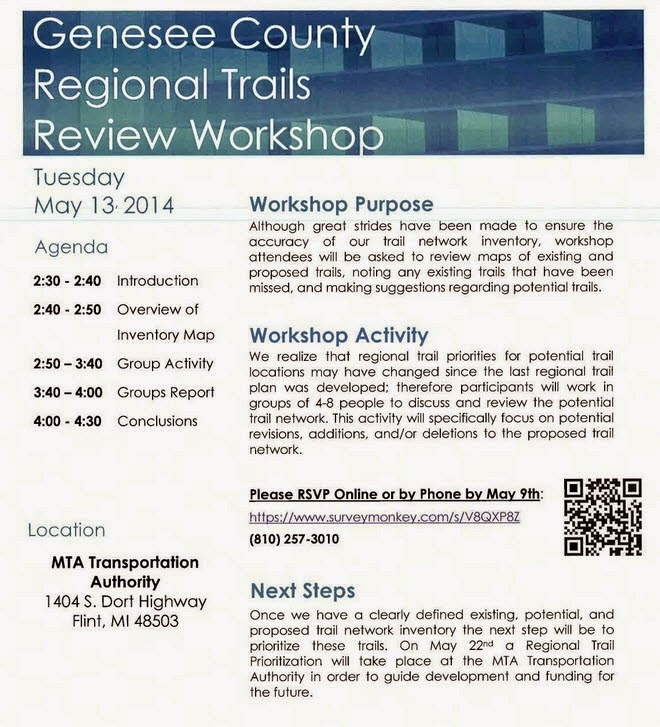 second meeting will be May 22, 2014.
our "Blue Water Trails" along the Shiawassee and Flint rivers. 7 - Wednesday - Headwaters Trails meeting in the Holly Village Chambers attached to the Police Station, 7 pm. 18 - Sunday - River Cleanup by Headwaters Trails, Water Works Park in Holly to Strom Park in Fenton, meet at 9 am at Water Works Park, expect to go to 2 pm. See www.headwaterstrailsinc.org for more info. 1 - Sunday - River Cleanup by Headwaters Trails, WW Park to Strom Park, meet at 9 am at Water Works Park, expect to go to 2 pm. See www.headwaterstrailsinc.org for more info. 4 - Wednesday - Headwaters Trails meeting in the Holly Village Chambers attached to the Police Station, 7 pm. with your boat to WaterWorks Park. 21 - Saturday - City of Linden / Argentine Township River Cleanup. 28 - Saturday - City of Fenton - Fenton to Lake Ponemah river cleanup. 2 - Wednesday - Headwaters Trails meeting in the Holly Village Chambers attached to the Police Station, 7 pm. 19 - Saturday - Keepers of the Shiawassee Sunrise Breakfast Paddle - DNR Boat Launch, Lake Ponemah in Fenton. 6 - Wednesday - Headwaters Trails meeting in the Holly Village Chambers attached to the Police Station, 7 pm. 9 - Saturday - City of Linden - Flotilla - Starting downtown Linden and paddle to Spoonz Restaurant on Lake Ponemah. 3 - Wednesday - Headwaters Trails meeting in the Holly Village Chambers attached to the Police Station, 7 pm. 1 - Wednesday - Headwaters Trails meeting in the Holly Village Chambers attached to the Police Station, 7 pm. 4 - Saturday - Fall Color Paddle by Headwaters Trails, from Water Works Park in Holly to Strom Park in Fenton. Registration starts at Noon, boats put in at 1:00. Saturday morning sunrise paddles organized by the Keepers of the Shiawassee will meet at the DNR Boat Launch on Lake Ponemah and paddle to downtown Linden for breakfast. Times listed are paddles wet times. If you are aware of blockages on the Shiawassee River between Water Works Park and Byron, you can report these to Chuck Julian at HeadwatersTrailsInc@gmail.com. We will try to schedule cleanups to get as many blockages as we can. The Keepers of The Shiawassee has meetings the 2nd Thursday of each month. These are normally at the Fenton Community Center from 7 - 9 pm. In June, July and August the meetings will be on the river and meetings places will be announced at a later date. You can report river blockages to the Keepers at 810-750-4067. or contact Debbie McCarty at 810-560-2337 and Maggie Yerman at 810-735-9570, yerantmag@yahoo.com. The next step in the removal of the Shiatown dam is starting to take shape. 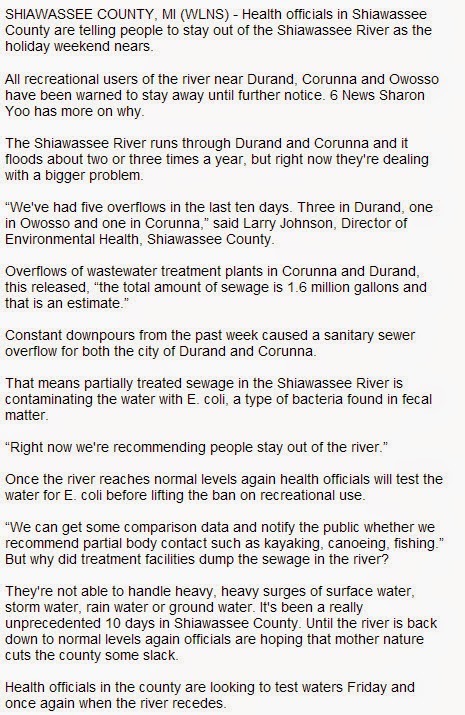 according to Tom Cook, president of the Friends of the Shiawassee River. the Friends to help with the removal process after studies revealed safety concerns. at waterfowl areas managed by the Michigan Department of Natural Resources. The DNR's Wetland Wonders program focuses on locations in the southern part of the state. 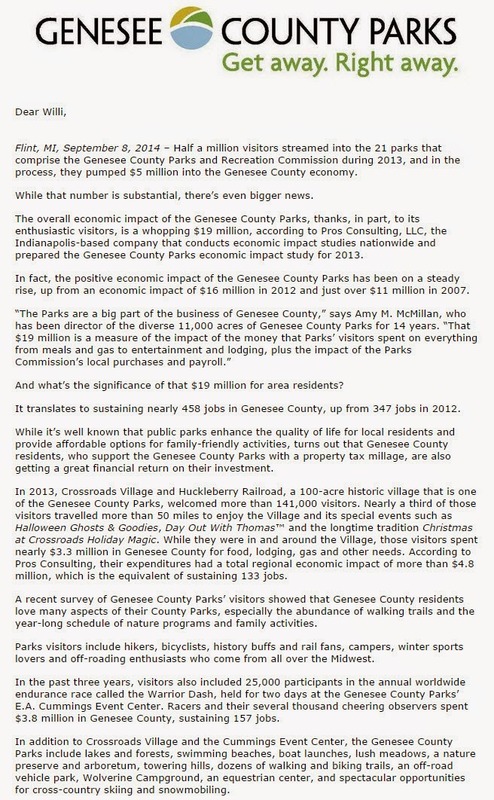 They include Shiawassee River State Game Area. trumpeter and tundra swans, osprey, bald eagles and sandhill cranes. DNR biologists and technicians lead the tours. M-21 bridge alongside the Shiawassee River. beginning in Corunna's McCurdy Park and ending in Owosso's Green Meadows Park. passing by dozens of the areas best attractions. the north and south sides of the river, adding another mile to walk, bike or run. 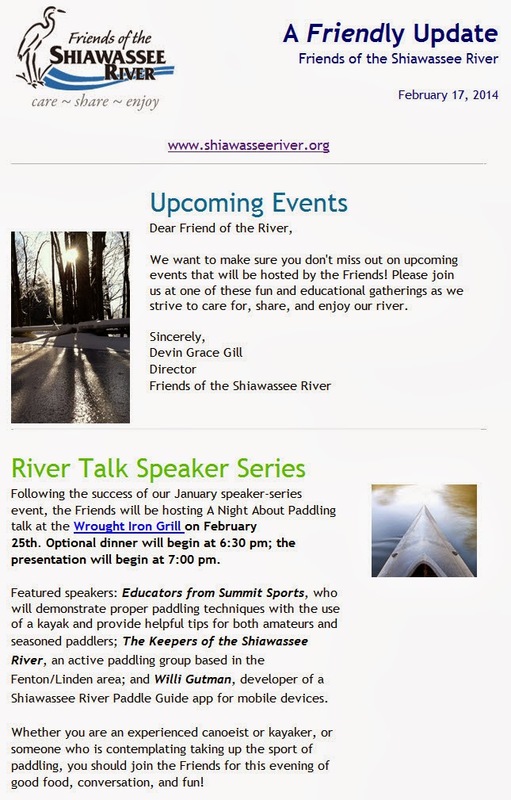 with Guest Speakers from Keepers of the Shiawassee. New Webpage with tons of new contact. Get involved, share info, experiences, knowledge, etc. like Email, Facebook, and Twitter. Great Lakes Restoration Initiative Program. an array of water quality issues. - Assessing how the river can better support recreational opportunities. at the local level - among local government planners, elected officials, and associated agencies. scheduled for October 17th, 2013 at the Baker College of Owosso Welcome Center. 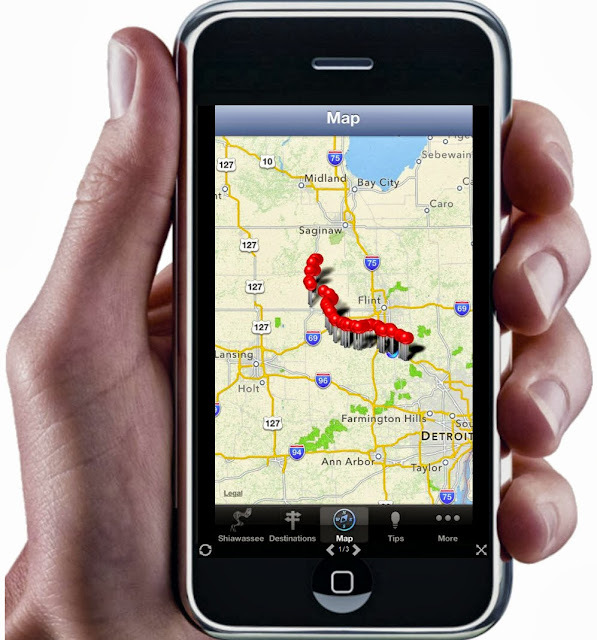 to network with each other and conservation professionals regarding watershed topics. - Enhancement of recreation and fisheries. to enable more personalized assistance in the future. Initial survey results will be reported at the Summit. to participating localities seeking water quality enhancement. 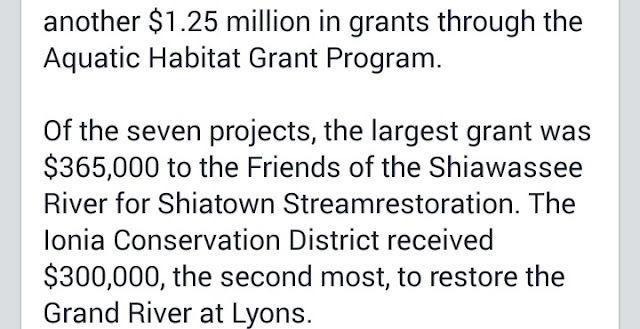 funded by the grant : a small, green infrastructure project; and a larger watershed-enhancement project. will maximize positive impact on the river’s health. Remember, what happens upstream, flows downstream. for more information on the MSU/Friends Partnership and learn what you can do to help. poor maintenance, flood damage and poor designs. of the advocacy group American Rivers. that may collapse and creates recreational opportunities for anglers and kayakers. The director of Michigan State University’s Knight Center for Environmental Journalism. Looking for feedback, comments, perceptions, ideas, etc. Official Movie Release "Come Paddle With Us"
Come Paddle With Us from Hover Shots APV on Vimeo. and flows 100 miles to Bay City, Michigan, USA. 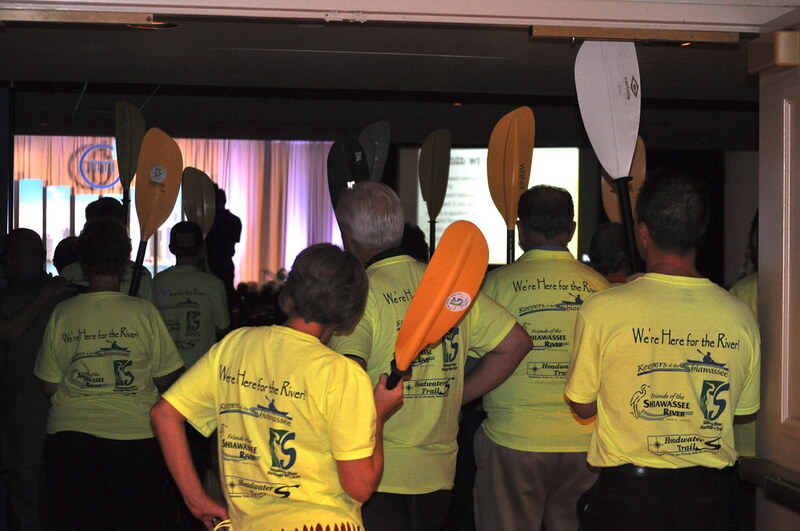 on Wednesday Sept. 18 '13 to lend support for the "Come Paddle With Us"
video presentation at the Michigan Municipal League Conference. Welcome to the Michigan Municipal League 2013 Convention in Detroit! as we all work together for a better Michigan. The long-awaited presentations of the Community Excellence Award nominees. from Holly to Fenton, and moonlight paddle events.